To experience ‘the knobby sphere illusion’ you will need one pencil and a small round hard sphere. 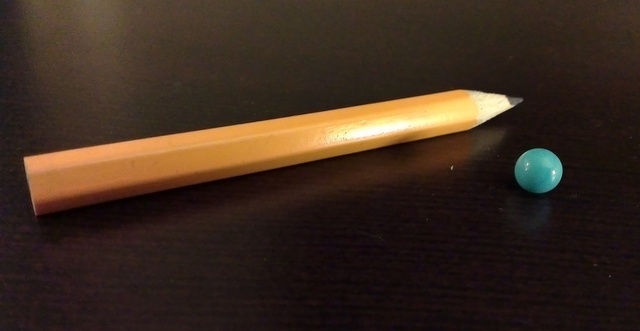 Squeeze the pencil lengthwise very hard between your thumb and first finger for 60 seconds, making a deep indentation in the skin. Now feel the ball bearing at the location of the indentation by rolling around in the skin indentation. It no longer feels round, but instead feels like it has rounded corners, as if the ball were in fact sort of hexagonal in cross-section. This is because the brain assumes the receptor sheet is flat, and misattributes the ‘cornerness’ to the ball. Bottom-line: Deforming the receptor sheet leads to misperceiving the shape of objects.